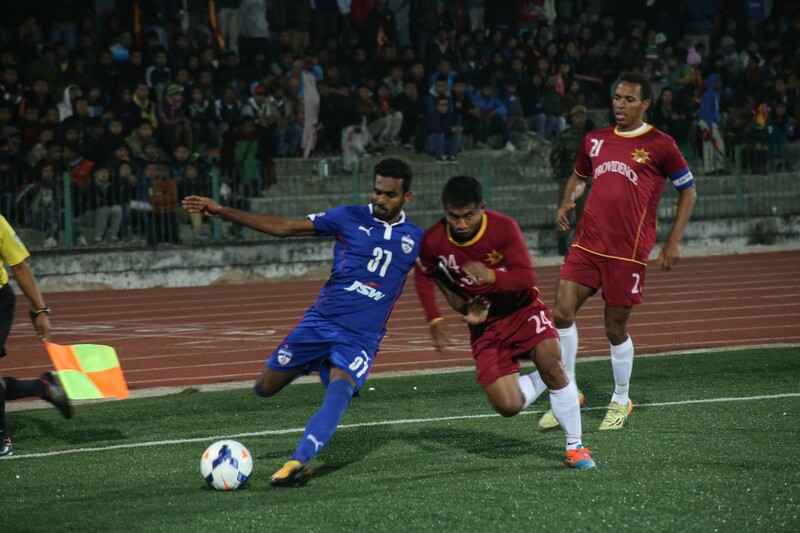 SHILLONG: An intense Hero I-League Round 4 match in Shillong saw Bengaluru FC rout table toppers Royal Wahingdoh FC 4-0 on Saturday at the JLN Stadium. A brace from Thoi Singh nicely complemented one goal each by Eugeneson Lyngdoh and CK Vineeth to help BFC get their Hero I-League campaign going. Both sides created their fair share of opportunities in the first half, which saw the action swing evenly from one side of the pitch to the other. The tireless Kim Song Yong was Bengaluru’s biggest threat, but the defenders in blue managed to have him covered. In just the fifth minute the Korean put in a diving header that saw the ball go over the bar and around 10 minutes later the visitors received a stroke of luck when another one of his shots struck the crossbar and stayed out. At the other end, John Johnson made Wahingdoh goalkeeper Nikhil Bernard put in a tremendous save by diving to his right. BFC broke the deadlock in the 34th minute with the hosts guilty of a little laxity in defence. A cross from the right saw Vineeth unmarked and he headed the ball neatly past Bernard. The Royals’ defence looked even more haphazard in the second half with Vineeth a particular danger. However, it turned out to be local boy Lyngdoh, recently signed by the defending champions this season, who doubled the lead for Bengaluru on the hour mark. He timed his run beautifully to meet a lofted ball that he slammed into the net after going one-on-one with the goalie. Seven minutes later Thoi scored the first of his two goals getting the ball to come off the crossbar before going into the net. Thoi then beat the defenders for an easy dab into the net in the 78th minute. Wahingdoh seemed tired from then on and their attacks lacked real bite. Bengaluru were happy with their lead and held on for an excellent 4-0 victory.